New York’s a great bread town; its best bakeries are really world class. But if you start sampling restaurants not neccesarily known for their bread, it gets kind of variable. 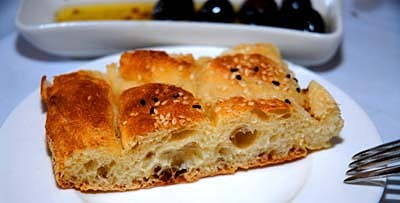 It’s a real disappointment to sit down to a week of great restaurant meals in one of the world’s great food cities, and find that only one of them is accompanied by good bread (pictured above; a Turkish pita with black and white sesame seeds at Zeytin Turkish Restaurant and Bar, on the Upper West Side). Zeytin’s pita, done by a bakery service, has been a bread high point of a nine-day stay in the Big Apple. But at a fantastic little French-Algerian place, the baguette was comically dismal– it actually CRUMBLED when pressed in the hand (don’t ask about the mouth). This restaurant takes itself very seriously (the terrific and authentic couscous was $38 a plate). Why the gap between food and bread? We all need to complain more (like New Yorkers, which is exactly what our hosts did the next night, when faced with overtly stale Italian peasant bread at their reliable Midtown trattoria where they are well-known to the staff). Alas, there was no fresh bread in the restaurant at 10:30 on a Wednesday. So for great restaurants with lousy bread, I’m proposing B.Y.O.Bread rules. Make your own and bring the stuff. It will raise eyebrows and consciousness. Meanwhile, here’s a pita recipe that WON’T puff, in the style of Greece or Turkey. 1. Twenty minutes before baking, preheat the oven to 450 degrees F with a baking stone near the middle of the oven. Place a broiler tray on any other shelf that won’t interfere with the bread. 2. Just before baking, dust the surface of the refrigerated dough with flour and cut off a 1-pound (grapefruit-size) piece. Dust the piece with more flour and quickly shape it into a ball by stretching the surface of the dough around to the bottom on all four sides, rotating the ball a quarter-turn as you go. Place the ball on a flour-dusted pizza peel. 3. Using your hands and a rolling pin, roll the dough out into a round with a uniform thickness of 1/4-inch. Sprinkle with more flour as needed to prevent sticking. 4. Place the dough round on a flour-covered pizza peel. Brush the surface with melted butter, slash the surface with at least three or four cuts with a serrated knife, and sprinkle with black and white sesame seeds. 5. Slide the loaf directly onto the hot stone. Pour 1 cup of hot tap water into the broiler tray, and quickly close the oven door. Bake for about 15 to 20 minutes, until golden brown. 6. Serve warm or at room temperature with Greek or Turkish dips or appetizers, like taramasalata. Just received the book from a dear friend and I have been baking up a storm!! Awesome results. Questions: Can you substitute powdered buttermilk reconsitituted with water for the buttermilk bread? Also, I couldn’t find the information as to when to add the sunflower seeds in the breakfast loaf. Do you add them all to the dough or save some to sprinkle on the top? One tip that has worked well for me when cutting the pecan caramel rolls (which we just finished eating – yum) is to use unflavored dental floss. Slide it under the roll to be cut, bring the ends to the top and cross them over and pull. It cuts the rolls beautifully and there is no flattening that may occur if using a knife. Thanks again for this amazing book – I know it will be a best seller. Sorry, I couldn’t find a place on the web site to leave questions about the book, so don’t now if this appropriate question here. In the spicy pork bun recipe, on page 89 it says to put a broiler pan for water in the oven. However, it never says to actually add the water. Several other recipes specifically say to add a cup of water and quickly close the door. So I’m wondering if this were omitted here – or was the broiler tray step listed incorrectly? I’m so glad you are enjoying the book. I think the powdered buttermilk will work just fine in the butter milk bread recipe (p. 207). The sunflower seeds should be added into the sun flower seed breakfast bread dough (p.217) when you add the flour. You can certainly reserve a few to sprinkle on top. Thank you for catching that omission for us. We combed through this book several times and yet a few details seemed to have been missed. I have a recipe for Oat-Wheat Bread from Covert Bailey’s Target Recipes book which I love to make. Sadly both the rise and the crumb (too dense) are never quite what I would like them to be BUT the taste is top-notch. I’m wondering if I could adapt your methods to this recipe if I just keep the yeast: salt: water: flour (and in this recipe – oatmeal) ratios similar to yours. Any suggestions? pre-ordered the book thru amazon.com after a heads up from the NYTimes. I LOVE the bread and look forward to lots more fun with the recipes and experimenting. I halved the basic recipe and had perfect results from the first boule. If you’re finding Baily’s recipe too dense and poorly rising, my guess is that this is not a good candidate for conversion to our approach, so I didn’t reprint your ingredients and amounts. My guess is that the problem is that it combines oats AND lots of whole wheat. Both of those are going to increase density and push the limits of our approach (neither oats nor wheat bran have any gluten which is essential for rising). We do something similar in our 100% whole wheat recipe (page 76), but we don’t add oats to the mix. Having said that, feel free to push the liquids, store the dough, and let us know how you make out. But I am bit skeptical, given your experience with this recipe as a FRESH dough. My sister just sent me a copy of the article in the Star-Tribune with the recipe, since she knows I am always looking for ways to make good bread in China (it’s hard to find in the shops). So now I plan to order the book to try the other recipes, but first a question: in the recipes that seem to call for bread flour, what to use instead, and since pizza peels are unavailable here, are they sine qua non, or can I make do without? James: for our few recipes that call for bread flour (like the pain d’epi), we were going for a stiffer, more form-holding effect. If you don’t have bread flour (which is higher in protein and absorbs more water), you can use a little extra all-purpose, maybe a quarter-cup more in our standard-sized recipes. After trying your recipe on The Splendid Table website (and tasting the delicious bread made) I had to go out and buy your book to try more recipes. As I try to decide which bread to bake next, I was wondering if all of the recipes that suggest using a loaf pan can also be made on a stone. Well, it’s a qualified yes. For the non-enriched breads, you can take any of the loaf pan breads and do them as free-forms. Generally, the free-forms take less oven time so watch that you don’t overbake. It sounds like the bowl you are using is going to work just fine for you. As long as the Tupperware container is not airtight it too will work. The only things we recommend is that the container be big enough to store a full batch (about 6 qts) and have a non-airtight lid. What ever fits in your refrigerator best is what you should go with. Thanks and enjoy the bread! hi from australia its bout quarter past eleven at night i was craving some fresh crusty bread so i made two loaves. we just finished one and a half of those loaves with fresh haloumi drizzled with olive oil and some green olives on d side. delicious. but one question, the inside of the loaf was ‘holey’ kind’ve like a ciabatta did i do something wrong? it was still delicious though. about that yummy turkish pide bread i thought it was supposed to have yoghurt in the dough? Nads: the big holes happen in stored dough, especially in the longer-stored stuff, so that’s typical. I like the large holes but if you don’t, make smaller batches and use them up quicker. I just started baking bread using your method and the experience is truly life-changing. Next time you are in the New York City area, seek out the loaves at Bread Alone. Absolutely phenomonal, especially their whole grain breads. They are located mostly in the Hudson Valley, but they sell at NYC farmers markets (most notably the Union Square Market). I have been trying to recreate their “Whole Grain Health” loaf using the 5 Minutes A Day method, but have not yet made it turn out quite right. It’s 100% whole wheat (but you’d never know it by the mild flavor), sourdough starter, studded with flax and sunflour seeds, and sweetened with a little honey. I could eat it every day for the rest of my life and never tire of it. I even ordered it by mail once (since I know longer live in NY) because I missed it so much, which was an absurd and costly indulgence. Even more reason to try to figure out a home-baked version!! Your timing is great for this question, we just finished a book all about whole grains and healthy breads that will be out this fall. There are a few recipes in the book that sound like the one you are looking for! I will look up this bakery, sounds great! I’m curious about the size of the pita bread. (Same for the other Easter flatbread recipes.) Do you really make ONE pita bread with a 1# ball? If not, how many pieces do you divide it into and at what point? I have tried making the basic recipe two times now. The first go-around was a half-recipe that resulted in two disappointed boules. The color and crust was good, but the top of the bread had large air pockets and the bottom of the bread was a big lump of gummy dough. The second go around, I used a fresh bag of flour and got marginally better results. I still have very large (quarter-sized) air holes in the top of the loaf but the bottom is a dough hockey puck. I have been really careful to follow the recipe closely. I’ve viewed the videos and feel I am not kneading or over-working the dough. I wonder if you are using an oven thermometer? If you are baking a 1-pound loaf for the recommended amount of time and it is still coming out gummy, I suspect that your oven is running a little too cool. It is easy to fix if you have an oven thermometer. It is also important, but difficult, to resist cutting the bread when it is warm. The bread will be gummy until it has cooled and released the internal steam. I am using an oven thermometer and it reads 450* (I can even see it during the baking process). I’m also using a pizza stone and baking for 30 minutes. At the 30 minute mark, the crust ranges from golden to dark brown with a few spots of really dark brown. I am taking the amount of dough to make a 1-lb loaf (1/2 of a the halved recipe, 1/4 of the reg recipe). The last loaf I baked last night (took it out of the oven around 10:30p). It cooled on a wire rack overnight. When I sliced it at 9:30 this morning, it was cold. I am going to try another loaf tonight – the dough will have been in the container in the fridge for almost 24 hours. Hi Jolinda: I’ll take a crack at it too (Zoe and I do shifts on the website)… Any chance you are using bleached flour rather than UNBLEACHED all-purpose flour? If so, that will result in a too-wet dough that just doesn’t get done in the center. Where are you located? What brand of flour are you using? Exactly which of our recipes are you using? How are you measuring the flour? We’ll take it from there, should be able to figure out the problem. Thanks Jeff… the help is definitely appreciated. I really want to be able to use all the recipes in the book but wanted to master the basic one first. I can say that the 2nd batch of flour was definitely unbleached all-purpose flour, Whole Foods brand label. I live in the Nashville, TN area and am using the basic boule recipe ( 1 1/2 Tbsp rapid-rise yeast, 1 1/2 Tbsp coarse salt, 3 c lukewarm water-tested with thermometer at 98*, 6 1/2 c of flour measured out in the scoop & sweep method). Mixed the water, yeast and salt in a 6 qt container, added the flour and stirred it until no dry flour remained. The dough was really sticky. I let it rise in the lidded container on the counter for 3 hours (my kitchen temp was around 68*). I refrigerated the dough for 4 hours, and then took enough to bake a 1 lb. loaf. Once the dough rested over night did it feel tighter at all? The dough when it is fresh is very soft and more difficult to work with. If not, you may just want to add another 1/4 cup of flour to your next batch and see if that helps. Our dough is quite wet, but you should be able to handle it. If Whole Foods is bagging a local flour it may be a soft southern flour that is lower in protein and therefore will not have as much gluten and result in a wet dough? Or your flour may have been more aerated for some reason when you measured it. Did you already have a chance to watch our videos to see if your dough looks like ours? http://artisanbreadinfive.com/?page_id=63 be sure to scroll down to the videos about Artisan Bread in Five.